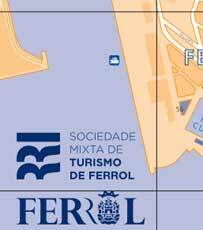 Ferrol is located in the north of the province of A Coruña, in the Galician region known as Rías Altas. It currently has a population of 67,569, but its area of influence, Ferrolterra, which groups the areas of Ferrol, Eume and Ortegal, exceeds 300,000 inhabitants. The surface of the council reaches 81.9 km2 and presents many contrasts: the Old Part of Ferrol, of medieval layout; the Magdalena neighborhood, a rationalist neighborhood with galleries and modernist houses, imposing military constructions next to the estuary, almost virgin beaches in the rural area, etc. In Ferrol you can find spectacular sandy beaches, paradises for surfing, such as Doniños, San Jorge, Esmelle, A Frouxeira, Santa Comba, Ponzos, etc.